I always find Daylight Savings to be a boring topic. 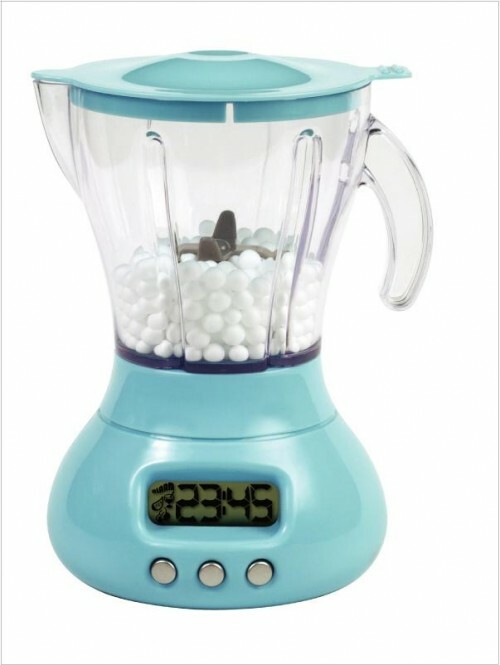 But, it does do one thing for me... it reminds me of sweet alarm clock options. 1.) 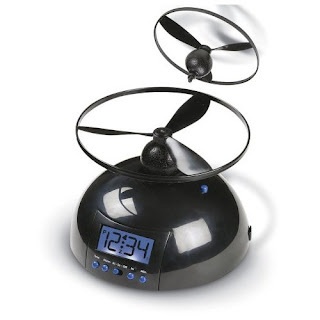 Flying Alarm Clock, $14, The propeller takes off when the alarm sounds and you have to retrieve it and stick it in the pinhole, like a key, to shut it off. 2.) 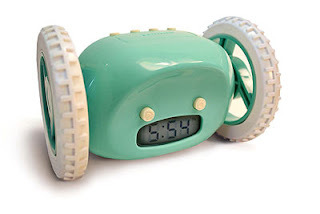 Clocky and or Tocky, $40 - $70, Like a little robot, Clocky takes a plunge off the dresser and runs in circles beeping until you find him to shut him off. Its predecessor Tocky works in similar fashion. 3.) Relax Melodies HD app – Free, This is an awesome way to feel like you're going to bed every night in a rainforest, beach, thunderstorm or serene scene of choice. Set the timer for your length in chosen sounds or created compilations. 33 sounds to choose from with optional alarm. I often use this to mask my NYC apartment living - That's not a gunshot that's an Irish drum! 4. ) 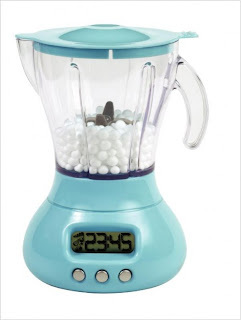 Blender Alarm Clock , $71, Wakes you up by blending its Styrofoam beads while generating one of four annoying tunes. 5.) 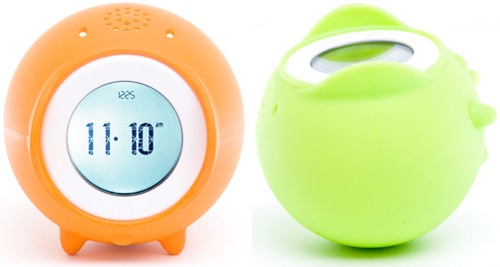 Sonic Alert Bed Shaking Alarm Clocks, $35-$80, Piercing decibels and bed shaking. Enough said. 6.) 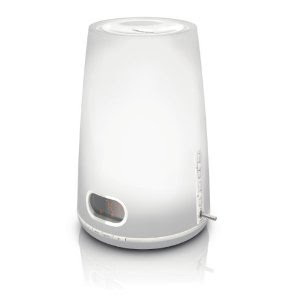 Philips Wake Up Light, $84, It is said both sunshine and daylight have a positive effect on our moods. Taking a cue from that the Philips Wake Up Light gradually and naturally simulates sunrise and begins brightening the room thirty minutes before your scheduled wake up. Optional alarm included for sleep-in paranoia. 7.) 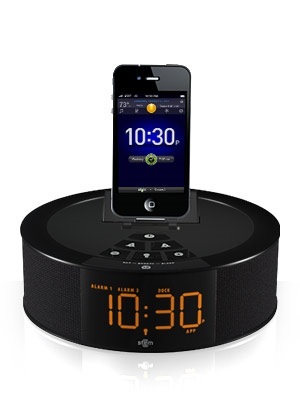 TimeCommand, $100, Dock your iPhone, iPod Touch or iPad and sync it with the free TimeCommand app. You can fall asleep or wake up to your iPod, internet radio or soothing relaxation sounds. 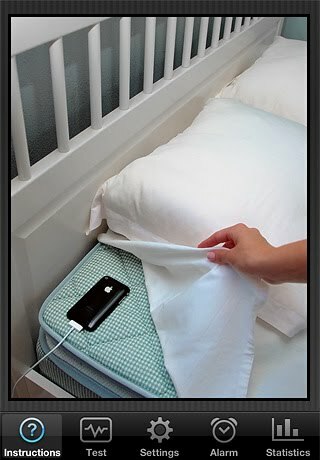 Also control and dim your bedside lamp including being able to wake up by light. Plus its a sweet speaker dock. 8.) 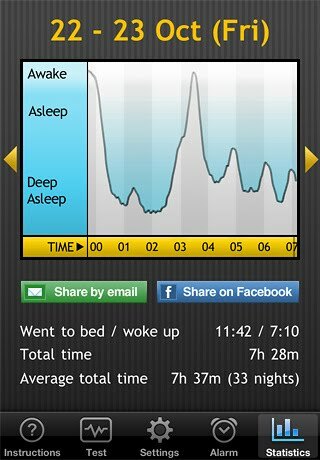 Sleep Cycle app - $0.99, Calculates, tracks and logs your body movements throughout the night and wakes you up with ridiculous tones like “fondest memories” and “forest glade”. It has done a great job reminding me how little sleep I get and how and when I toss and turn, so interesting! 9.) Laser Alarm Clock, $20, Ready, aim, fire… to stop the noise. 10.) 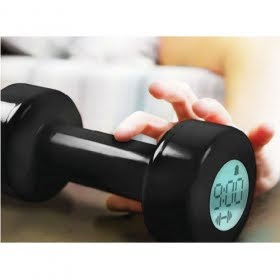 Dumbbell Alarm Clock, $26, Because nothing is more horrible than having to do 3 sets of 10 dumbbell curls in order to shut your alarm off first thing in the am.